For the cells of the electrical conduction system of the heart, see Purkinje fibers. Purkinje cells, or Purkinje neurons (/pərˈkɪndʒiː/ pər-KIN-jee), are a class of GABAergic neurons located in the cerebellum. They are named after their discoverer, Czech anatomist Jan Evangelista Purkyně (Czech: [ˈpurkɪɲɛ]). These cells are some of the largest neurons in the human brain (Betz cells being the largest), with an intricately elaborate dendritic arbor, characterized by a large number of dendritic spines. Purkinje cells are found within the Purkinje layer in the cerebellum. Purkinje cells are aligned like dominos stacked one in front of the other. Their large dendritic arbors form nearly two-dimensional layers through which parallel fibers from the deeper-layers pass. These parallel fibers make relatively weaker excitatory (glutamatergic) synapses to spines in the Purkinje cell dendrite, whereas climbing fibers originating from the inferior olivary nucleus in the medulla provide very powerful excitatory input to the proximal dendrites and cell soma. 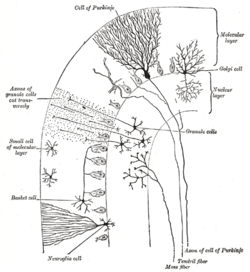 Parallel fibers pass orthogonally through the Purkinje neuron's dendritic arbor, with up to 200,000 parallel fibers forming a Granule-cell-Purkinje-cell synapse with a single Purkinje cell. Each Purkinje cell receives ca 500 climbing fiber synapses, all originating from a single climbing fiber. Both basket and stellate cells (found in the cerebellar molecular layer) provide inhibitory (GABAergic) input to the Purkinje cell, with basket cells synapsing on the Purkinje cell axon initial segment and stellate cells onto the dendrites. Purkinje cells send inhibitory projections to the deep cerebellar nuclei, and constitute the sole output of all motor coordination in the cerebellar cortex. There is evidence in mice and humans that bone marrow cells either fuse with or generate cerebellar Purkinje cells, and it is possible that bone marrow cells, either by direct generation or by cell fusion, could play a role in repair of central nervous system damage. Further evidence points yet towards the possibility of a common stem cell ancestor among Purkinje neurons, B-lymphocytes and aldosterone-producing cells of the human adrenal. Microcircuitry of the cerebellum. Excitatory synapses are denoted by (+) and inhibitory synapses by (-). Simple spikes occur at rates of 17 – 150 Hz (Raman and Bean, 1999), either spontaneously or when Purkinje cells are activated synaptically by the parallel fibers, the axons of the granule cells. Complex spikes are slow, 1–3 Hz spikes, characterized by an initial prolonged large-amplitude spike, followed by a high-frequency burst of smaller-amplitude action potentials. They are caused by climbing fiber activation and can involve the generation of calcium-mediated action potentials in the dendrites. Following complex spike activity, simple spikes can be suppressed by the powerful complex spike input. The Purkinje cell protein 4 (PCP4) is markedly immunoreactive in the Purkinje cells of the human cerebellum. From top to bottom 40X, 100X and 200X microscopic magnifications. The immunohistochemistry was performed based on published methods. Purkinje cells show spontaneous electrophysiological activity in the form of trains of spikes both sodium-dependent and calcium-dependent. This was initially shown by Rodolfo Llinas (Llinas and Hess (1977) and Llinas and Sugimori (1980)). P-type calcium channels were named after Purkinje cells, where they were initially encountered (Llinas et al. 1989), which are crucial in cerebellar function. We now know that activation of the Purkinje cell by climbing fibers can shift its activity from a quiet state to a spontaneously active state and vice versa, serving as a kind of toggle switch. These findings have been challenged by a study suggesting that such toggling by climbing-fiber inputs occurs predominantly in anaesthetized animals and that Purkinje cells in awake behaving animals, in general, operate almost continuously in the upstate. But this latter study has itself been challenged  and Purkinje cell toggling has since been observed in awake cats. A computational model of the Purkinje cell has shown intracellular calcium computations to be responsible for toggling. pumps in the cerebellum and this is likely how it corrupts cerebellar computation and body co-ordination. The Purkinje layer of the cerebellum, which contains the cell bodies of the Purkinje cells and Bergmann glia, express a large number of unique genes. Purkinje-specific gene markers were also proposed by comparing the transcriptome of Purkinje-deficient mice with that of wild-type mice. One illustrative example is the Purkinje cell protein 4 (PCP4) in knockout mice, which exhibit impaired locomotor learning and markedly altered synaptic plasticity in Purkinje neurons. PCP4 accelerates both the association and dissociation of calcium (Ca2+) with calmodulin (CaM) in the cytoplasm of Purkinje cells, and its absence impairs the physiology of these neurons. In humans, Purkinje cells can be harmed by a variety causes: toxic exposure, e.g. to alcohol or lithium; autoimmune diseases; genetic mutations causing spinocerebellar ataxias, Unverricht-Lundborg disease, or autism; and neurodegenerative diseases that are not known to have a genetic basis, such as the cerebellar type of multiple system atrophy or sporadic ataxias. Some domestic animals can develop a condition where the Purkinje cells begin to atrophy shortly after birth, called cerebellar abiotrophy. It can lead to symptoms such as ataxia, intention tremors, hyperreactivity, lack of menace reflex, stiff or high-stepping gait, apparent lack of awareness of foot position (sometimes standing or walking with a foot knuckled over), and a general inability to determine space and distance. A similar condition known as cerebellar hypoplasia occurs when Purkinje cells fail to develop in utero or die off before birth. The genetic conditions ataxia telangiectasia and Niemann Pick disease type C, as well as cerebellar essential tremor, involve the progressive loss of Purkinje cells. In Alzheimer's disease, spinal pathology is sometimes seen, as well as loss of dendritic branches of the Purkinje cells. Purkinje cells can also be damaged by the rabies virus as it migrates from the site of infection in the periphery to the central nervous system. ↑ Purves D, Augustine GJ, Fitzpatrick D, Hall WC, LaMantia A, McNamara JO, and White LE (2008). Neuroscience. 4th ed. Sinauer Associates. pp. 432–4. ISBN 978-0-87893-697-7. ↑ Tyrrell, T; Willshaw, D (1992-05-29). "Cerebellar cortex: its simulation and the relevance of Marr's theory.". Philosophical transactions of the Royal Society of London. Series B, Biological sciences. 336 (1277): 239–57. doi:10.1098/rstb.1992.0059. PMID 1353267. ↑ Wadiche, JI; Jahr, CE (2001-10-25). "Multivesicular release at climbing fiber-Purkinje cell synapses". Neuron. 32 (2): 301–13. doi:10.1016/S0896-6273(01)00488-3. PMID 11683999. ↑ Hess DC, Hill WD, Carroll JE, Borlongan CV (2004). "Do bone marrow cells generate neurons?". Archives of Neurology. 61 (4): 483–485. doi:10.1001/archneur.61.4.483. PMID 15096394. ↑ Weimann JM, Johansson CB, Trejo A, Blau HM (2003). "Stable reprogrammed heterokaryons form spontaneously in Purkinje neurons after bone marrow transplant.". Nature cell biology. 5 (11): 959–966. doi:10.1038/ncb1053. PMID 14562057. ↑ Alvarez-Dolado M, Pardal R, Garcia-Verdugo JM, Fike JR, Lee HO, Pfeffer K, Lois C, Morrison SJ, Alvarez-Buylla A (2003). "Fusion of bone-marrow-derived cells with Purkinje neurons, cardiomyocytes and hepatocytes.". Nature. 425 (6961): 968–973. doi:10.1038/nature02069. PMID 14555960. 1 2 Felizola SJ, Katsu K, Ise K, Nakamura Y, Arai Y, Satoh F, Sasano H (2015). "Pre-B lymphocyte protein 3 (VPREB3) expression in the adrenal cortex: precedent for non-immunological roles in normal and neoplastic human tissues.". Endocrine Pathology. [Epub ahead of print]: 119–28. doi:10.1007/s12022-015-9366-7. PMID 25861052. ↑ Kemp K, Wilkins A, Scolding N (2014). "Cell fusion in the brain: two cells forward, one cell back.". Acta Neuropathologica. 128 (5): 629–638. doi:10.1007/s00401-014-1303-1. PMID 24899142. ↑ Eric R. Kandel, James H. Schwartz, Thomas M. Jessell (2000). Principles of Neural Science. 4/e. McGraw-Hill. pp.837-40. 1 2 3 Felizola SJ, Nakamura Y, Ono Y, Kitamura K, Kikuchi K, Onodera Y, Ise K, Takase K, Sugawara A, Hattangady N, Rainey WE, Satoh F, Sasano H (Apr 2014). "PCP4: a regulator of aldosterone synthesis in human adrenocortical tissues". Journal of Molecular Endocrinology. 52 (2): 159–167. doi:10.1530/JME-13-0248. PMC 4103644 . PMID 24403568. ↑ Loewenstein Y, Mahon S, Chadderton P, Kitamura K, Sompolinsky H, Yarom Y, et al. (2005). "Bistability of cerebellar Purkinje cells modulated by sensory stimulation.". Nature Neuroscience. 8: 202–211. doi:10.1038/nn1393. ↑ Schonewille M, Khosrovani S, Winkelman BH, Hoebeek FE, DeJeu MT, Larsen IM, et al. (2006). "Purkinje cells in awake behaving animals operate at the up state membrane potential.". Nature Neuroscience. 9: 459–461. doi:10.1038/nn0406-459. ↑ Loewenstein Y, Mahon S, Chadderton P, Kitamura K, Sompolinsky H, Yarom Y, et al. (2006). "Purkinje cells in awake behaving animals operate at the up state membrane potential–Reply.". Nature Neuroscience. 9: 461. doi:10.1038/nn0406-461. ↑ Yartsev MM, Givon-Mayo R, Maller M, Donchin O (2009). "Pausing Purkinje cells in the cerebellum of the awake cat.". Frontiers in Systems Neuroscience. 3: 2. doi:10.3389/neuro.06.002.2009. ↑ Kreitzer AC, Regehr WG (March 2001). "Retrograde inhibition of presynaptic calcium influx by endogenous cannabinoids at excitatory synapses onto Purkinje cells". Neuron. 29 (3): 717–27. doi:10.1016/S0896-6273(01)00246-X. PMID 11301030. ↑ Forrest MD, Wall MJ, Press DA, Feng J (December 2012). Cymbalyuk G, ed. "The Sodium-Potassium Pump Controls the Intrinsic Firing of the Cerebellar Purkinje Neuron". PLoS ONE. 7 (12): e51169. doi:10.1371/journal.pone.0051169. PMC 3527461 . PMID 23284664. ↑ Forrest MD (December 2014). "The sodium-potassium pump is an information processing element in brain computation". Frontiers in Physiology. 5 (472). doi:10.3389/fphys.2014.00472. ↑ Cannon C (July 2004). "Paying the Price at the Pump: Dystonia from Mutations in a Na+/K+-ATPase". Neuron. 43 (2): 153–154. doi:10.1016/j.neuron.2004.07.002. PMID 15260948. ↑ Calderon DP, Fremont R, Kraenzlin F, Khodakhah K (March 2011). "The neural substrates of rapid-onset Dystonia-Parkinsonism". Nature Neuroscience. 14 (3): 357–65. doi:10.1038/nn.2753. PMC 3430603 . PMID 21297628. ↑ Kirsch, L; Liscovitch, N; Chechik, G (December 2012). Ohler, Uwe, ed. "Localizing Genes to Cerebellar Layers by Classifying ISH Images". PLoS Computational Biology. 8 (12): e1002790. doi:10.1371/journal.pcbi.1002790. PMC 3527225 . PMID 23284274. ↑ Rong, Y; Wang T; Morgan J (2004). "Identification of candidate purkinje cell-specific markers by gene expression profiling in wild-type and pcd3j mice". Molecular brain research. 13 (2): 128–145. doi:10.1016/j.molbrainres.2004.10.015. 1 2 Wei P, Blundon JA, Rong Y, Zakharenko SS, Morgan JI (2011). "Impaired locomotor learning and altered cerebellar synaptic plasticity in pep-19/PCP4-null mice". Mol. Cell. Biol. 31 (14): 2838–44. doi:10.1128/MCB.05208-11. PMC 3133400 . PMID 21576365. ↑ Putkey JA, Kleerekoper Q, Gaertner TR, Waxham MN (2004). "A new role for IQ motif proteins in regulating calmodulin function.". J. Biol. Chem. 278 (50): 49667–70. doi:10.1074/jbc.C300372200. PMID 14551202. ↑ Kleerekoper QK, Putkey JA (2009). "PEP-19, an intrinsically disordered regulator of calmodulin signaling". J. Biol. Chem. 284 (12): 7455–64. doi:10.1074/jbc.M808067200. PMC 2658041 . PMID 19106096. ↑ For references, see the extensive references and bibliography at the article on Cerebellar abiotrophy, linked at the beginning of this paragraph. ↑ Mavroudis, IA; Fotiou, DF; Adipepe, LF; Manani, MG; Njau, SD; Psaroulis, D; Costa, VG; Baloyannis, SJ (November 2010). "Morphological changes of the human purkinje cells and deposition of neuritic plaques and neurofibrillary tangles on the cerebellar cortex of Alzheimer's disease". American Journal of Alzheimer's Disease & Other Dementias. 25 (7): 585–91. doi:10.1177/1533317510382892. PMID 20870670. ↑ Fekadu, Makonnen (27 March 2009). "Rabies encephalitis, Negri bodies within the cytoplasm of cerebellar Purkinje cell neurons". CDC/Frontal Cortex Inc. Retrieved 21 June 2013. Note: not peer-reviewed. Llinás R, Hess R (July 1976). "Tetrodotoxin-resistant dendritic spikes in avian Purkinje cells". Proc. Natl. Acad. Sci. U.S.A. 73 (7): 2520–3. doi:10.1073/pnas.73.7.2520. PMC 430632 . PMID 1065905. Llinás R, Sugimori M (August 1980). "Electrophysiological properties of in vitro Purkinje cell somata in mammalian cerebellar slices". J. Physiol. (Lond.). 305: 171–95. doi:10.1113/jphysiol.1980.sp013357. PMC 1282966 . PMID 7441552. Llinás RR, Sugimori M, Cherksey B (1989). "Voltage-dependent calcium conductances in mammalian neurons. The P channel". Ann. N. Y. Acad. Sci. 560 (1 Calcium Chann): 103–11. doi:10.1111/j.1749-6632.1989.tb24084.x. PMID 2545128. Forrest, Michael (October 2014). Biophysics and computations of the cerebellar Purkinje neuron. CreateSpace. ISBN 978-1502454546.